Driving through the village where I was born I spotted this beautiful house. I like the nicely decorated windows. That does look lovely, especially in the snow! Nice looking house. it has two entrance doors and each has two windows downstairs - what about the upper tree windows? Like @bruni I was a little confused by the outlay , is it one very large house or two semi-detached ! the ground floor suggests two houses while the first floor has an odd number of windows !! It looks a lovely well kept house ! Very nice. The window tops are lovely. Beautiful symmetry to the architecture and your photo. Very elaborate fancy looking design. Lovely home with pretty details over the windows. Thanks for your nice comments. The upstairs windows intrigued me too. I was also wondering about the design and whether it was a very large house or two smaller houses. The arcs over the Windows are quite different. 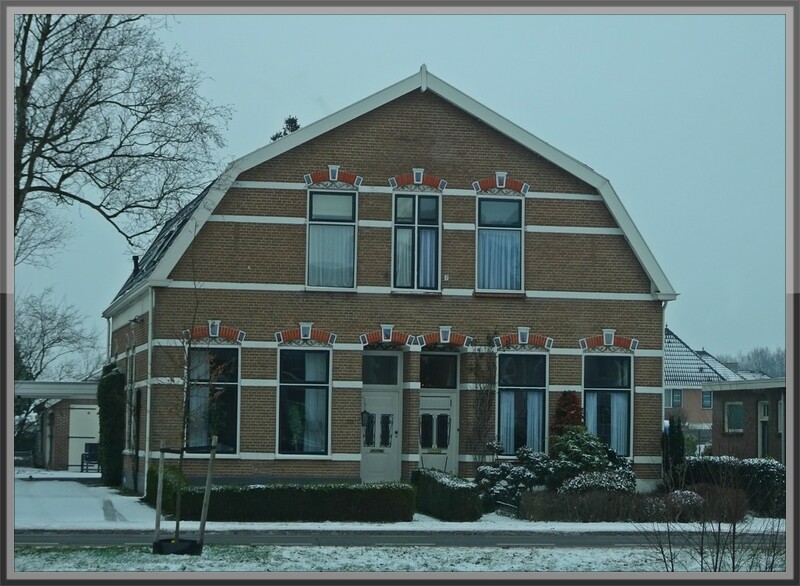 Mooi huis @gijsje Mij ook. It’s really lovely. Very distinctive.